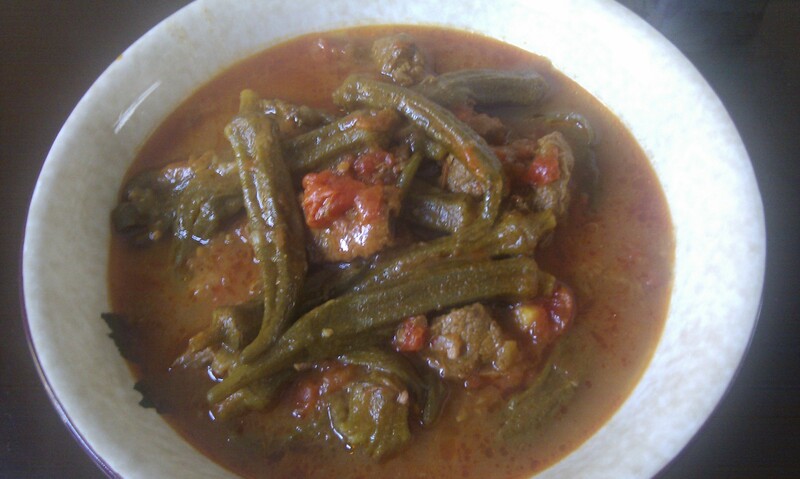 Otherwise known as Khoresht e Bamiyeh (khoresht-casserole, bamiyeh-okra) in Iran, this is a simple dish to make and extremely tasty but be warned it needs a good couple of hours to simmer away so the meat cooks nicely and is very tender. It’s even good for the children because even though they won’t eat the okra, it oozes it’s juices and goodness into the casserole sauce, giving it a nice simple spicy flavour that they will enjoy! I even get away with mashing an okra or two up for my little ones! Heat the oil in a large pan and add the chopped onions. Fry until golden brown, then add the turmeric, garlic and a little salt and pepper. Continue to fry on a high heat for 5 minutes then add the lamb. Keep stirring the lamb into the onion mixture making sure it is all covered, bring the heat down to medium and allow the meat to cook for 20 minutes whilst stirring to make sure it doesn’t stick to the bottom. Add the chopped tomatoes, and cover with water. Bring it to the boil then simmer for 60 minutes. After the 60 minutes, add the okra, (putting it in too early will result in a mush of okra) and simmer for a further 40 minutes or until the lamb is nice and soft. Serve alongside white rice and some cool fresh yogurt or greek yogurt! Note: You can substitute the lamb for beef, but increase the cooking time by about 20 minutes. If you prefer vegetarian, cook your preferred vegetables along WITH the okra for about 25 minutes or until cooked. You can make this in the slow cooker but be aware that the flavours come from frying the onion along with the spices and meat for 20 minutes before cooking. It won’t taste exactly the same but will still be a delicious meal all the same! 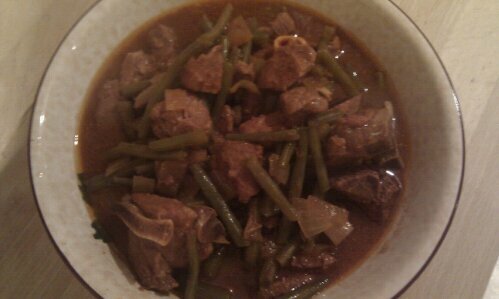 Lamb and green beans…slow cooked. Yesterday was a busy day for me. I had the in-laws coming around for tea and cake (like, TOTALLY shop bought) and I had a lot of washing and ironing to do (just call me the last minute homemaker!) On top of this my youngest is sick (we had a throw up festival) and I decided that I was going to completely overhaul and sort out my daughter’s room as well. I had put out some lamb the night before and the last thing that I really wanted to do was to cook a huge meal and stand over it, stirring and making sure it didn’t stick to the bottom of the pan or burn or anything SO I brought out my trusty three litre slow cooker and here is what I finally decided upon! I had previously bought half a leg of lamb from the butchers, chopped into medium sized casserole pieces INCLUDING the bone. You can either leave that out and make a soup stock later or cook it in the casserole like I do for added flavour. I split the half leg of lamb into two as there are two adults and two children, aged 5 and under who don’t eat huge portions. I recommend using fresh ginger and garlic but the *lazy* or ground varieties will work just as well if you can’t get to the shops. Add all the ingredients into the slow cooker and put it on high. Serve with white fluffy rice and greek yogurt. You can use beef if you don’t like lamb and you can also try the same thing with diced chicken breast as well.